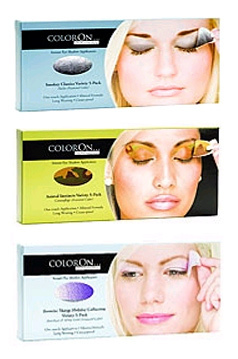 These COLORON … PROFESSIONAL Instant Eye Shadow Applicators ($16/5pairs @ coloronpro.com) are exactly what Cybelesays is all about -- trying and reporting on if a new way of doing something really works. And this works! How many times have you tried to mimic a picture in a magazine of a cool lid look but fell short? These oval applicators with the shadow designs right on them take the guess work out. Simply peel the backing off, position on the lid, press down, rub your nail all over it, gently remove and voila! Finish with a light dusting of powder to set and the colors aren’t moving for at least a couple of hours. Choose from smokey eye looks to the more experimental camoflage. One tip – after applying, use a small brush to blend it in and I like to dip the brush into some of the colors on the applicator to apply around the eye and in the corners. Such a great invention!